A memoir, an account of a murder trial, and an essay that interrogates the American obsession with violence and missing white women, exploring the nature of grief, justice, and empathy. Nelson's resistance to the easy answer, her willingness to reach a kind of conclusion and then to break it, to probe further and further, to ask about her own complex and not entirely noble intentions instead of facilely condemning others, make The Red Parts an uneasy masterpiece. It is a sounding, a wondering, not an autopsy (It was murder, I say!) or a condemnation. Nelson allows space for the truth: Maybe grief is a repeating cycle, not a hurdle to be passed, maybe there is no immunization, maybe we'll never feel entirely safe. Maybe women will always have to negotiate between freedom and safety, on and on in endless compromise. [In The Red Parts] there are haunting meditations on mortality and motion, leading to some achingly beautiful lyrical imagery ... In the force and precision with which she tells this story, Nelson makes that case adeptly here. It’s a haunting story of the aftermath of a death, but it’s also a powerful examination of numerous aspects of life. Nelson becomes distracted from Jane’s story by a failed love affair, which becomes off-putting because we get to know her partner only as 'the man I loved.' And vague, panicked explorations of the meaning of life and her 'disassociated, heartbroken fog' will be hard for any reader to sympathize with. But even at her weakest emotionally, Nelson is refreshingly self-critical — of herself and her writing project. She never figures out what it is that compels her to sit at the trial, 'jotting down all the gory details, no different or better than anyone else.' Is it that she wants Jane’s life to matter, she wonders, or her own? 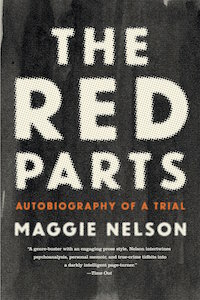 What did you think of The Red Parts: Autobiography of a Trial?